While he trails many of his opponents in name recognition, Buttigieg argues that he could represent a generational shift in government and speaks frequently of issues that will affect younger Americans, such as tax reform, gun control and climate change. "I get the audacity of somebody like me talking about running for this office, but frankly it's a leap for anybody," Buttigieg said on "This Week" in February. "And yet all of the people who had that job have been mortals who just bring their experience to the table. My experience is that of guiding a city through transformation, and I think a mayor at any level has the kind of executive frontline government experience and, by the way, problem-solving experience that we need more in Washington right now." 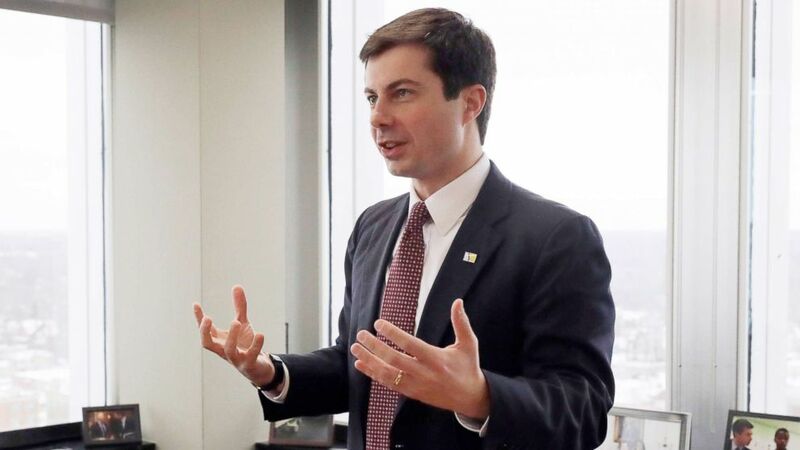 After signaling his intention to run when he launched an exploratory committee in January, Buttigieg officially entered the race on April 14 at a rally in his hometown of South Bend. "The forces of change in our country today are tectonic," Buttigieg said. "Forces that help to explain what made this current presidency even possible. That's why, this time, it's not just about winning an election - it's about winning an era." "I'm running for president because it's time for new leadership because it's time for new energy and it's time for a new commitment to make sure that the opportunities I've had are available for every American," he said. While Delaney, a millionaire entrepreneur and businessman before arriving in Congress, does not have the name recognition of the other likely candidates, he has already traveled to all of Iowa's 99 counties -- a right of passage for many caucus hopefuls -- and frequently discusses his pragmatic approach and desire to bridge political gaps. "What the American people are really looking for is a leader to try to bring us together, not actually talk like half the country's entirely wrong about everything they believe," Delaney said on "This Week" in January, adding, "One of the things I've pledged is in my first hundred days, only to do bipartisan proposals. Wouldn't it be amazing if a president looked at the American people at the inauguration and said, 'I represent every one of you, whether you voted for me or not and this is how I'm going to prove it.'" The New York Democrat formally announced her presidential run on March 17 in a video posted to her verified YouTube account. In January, she had announced that she was forming a presidential exploratory committee during an appearance on CBS' "The Late Show with Stephen Colbert." "I'm going to run for president of the United States because, as a young mom, I'm going to fight for other people's kids as hard as I would fight for my own," she said during the interview. "I'm running for every parent who wants a better world for their kids," Klobuchar said at her opening rally. "I'm running for every student who wants a good education. For every senior who wants affordable prescription drugs. For every worker, farmer, dreamer, builder. For every American. I'm running for you." The Minnesota senator is viewed favorably by some in Democratic circles for her ability to perform strongly in her home state -- part of a Midwestern region that helped President Trump to victory in 2016. The little-known Florida mayor joined the growing list of 2020 presidential candidates, announcing his candidacy on March 28 despite facing an uphill climb for his bid. Messam currently is the chief executive of a city of 140,000 residents, more than the city Buttigieg runs in Indiana. He is known by many Floridians for playing football for Florida State University in the 1990s. Despite his low national name recognition, Messam is confident in his chances. "When people get elected into Washington with no local government experience, they are so high in the stratosphere that they have no concept, no consciousness of some of the local challenges that cities and communities face. And America is basically a network of cities and communities," Messam said, according to the Associated Press. O'Rourke, who rose to national prominence during his ultimately failed challenge of Texas Sen. Ted Cruz in 2018, officially announced his presidential campaign in mid-March, calling it "a defining moment of truth for this country and for every single one of us." The former Texas congressman immediately embarked on his first ever trip to Iowa and visited Wisconsin as well during his first weekend on the trail. Within days, O'Rourke's campaign announced it raised over $6.1 million in the first 24 hours following his announcement, topping Sen. Bernie Sanders' previous high-water mark of $5.9 million. The Ohio Democrat, who announced his candidacy on ABC's "The View" on April 4, bills himself as a candidate who can unify the progressive wings of the Democratic Party with the more middle-of-the-road working-class voters. "We have politicians and leaders in America today that want to divide us, they want to put us in one box or the other, " he told the crowd at his kickoff rally in Youngstown on April 6. "You know, you can't be for business and for labor; you can't be for border security and immigration reform; right, you can't be for cities and rural America; you can't be for the North and the South; you can't be for men and women. I'm tired of having to choose." Ryan, a more moderate voice in the crowded field of competitors, rose to the national political stage in 2016 when he launched a failed bid to replace Rep. Nancy Pelosi, D-Calif., as House minority leader. He had previously been floated as a potential candidate in the 2014 Ohio gubernatorial election. The New York congressman and vocal critic of the president, officially launched his bid for the Democratic nomination on April 8, during an appearance on "The Late Show" with Stephen Colbert. Swalwell, who stopped in several early-voting states during the lead up to his announcement, is rooting his campaign agenda on the issue of gun control. Following his formal announcement, he held a town hall in Sunrise, Florida with Marjory Stoneman Douglas High School students and families. "I'm telling folks, keep your rifles, keep your shotguns, keep your pistols, we just want the most dangerous weapons out of the hands of the most dangerous people," Swalwell told ABC News Chief Anchor George Stephanopoulos on Good Morning America on April 9. "Most gun owners believe that." "I was stunned when I saw the disparities between Detroit and San Francisco or Cleveland and Manhattan. You feel like you're traveling across dimensions and decades and not just a couple of time zones," Yang told "Rolling Stone" in January. "None of our political leaders are willing to acknowledge the elephant in the room that is tearing our communities apart, in the form of technological change."